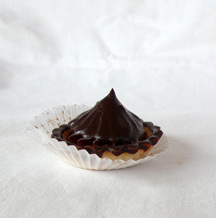 Masitas are teeny-tiny Argentine pastries. 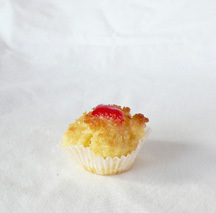 I’ve been obsessed with them since always and photographing them in their natural habitat for the last three years, but I only learned recently that these miniaturized pastries are basically the same thing as petits-fours. 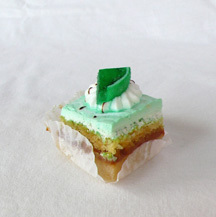 But do not confuse them with dumb squares that look like wrapped presents! 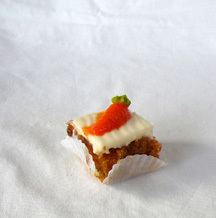 Here is a masita with a local twist–tiny carrot cake! 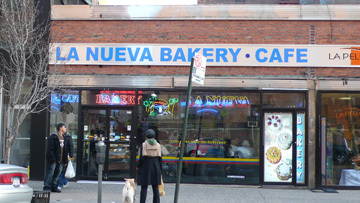 This entry was posted on January 24, 2008 at 8:07 pm and is filed under *Mariana, Bakery, dessert, new york, Queens. You can follow any responses to this entry through the RSS 2.0 feed. You can leave a response, or trackback from your own site. they’re adorable!!! like little jewels. I love the green one. I never would’ve guessed it was dulce de leche. My wife (a registered nurse) and I, as you might expect, prefer desserts of more substantial proportions.